Get Your Cardio Workout Indoors During the Extreme Weather! Perhaps like myself, you have found it difficult to fit your cardio workouts in during the extreme weather. We’ve had 100-degree heat waves for weeks now and we are preparing for a year of El Nino-caused torrential rain. So how are we going to keep our bodies moving and healthy? Come to the studio! We have plenty of cardio classes inside our lovely air-conditioned studios! Get hooked on these classes and you’ll keep yourself moving through El Nino too! Remember, it’s recommended to keep your body moving for 150 minutes a week. Visit our studio three times in a week, and you’ll hit that goal, as well as earn some extra studio cash! If you fit 15 or more sessions in at Pilates Studio City (at either location) in the month of September, you’ll earn yourself $20 account credit! Benefits to your body and your wallet! There are plenty of classes at a variety of times throughout the entire week that will get your heart rate up at our studio! 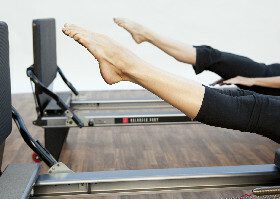 They are perfect complements to your slower, more-controlled Pilates workouts.